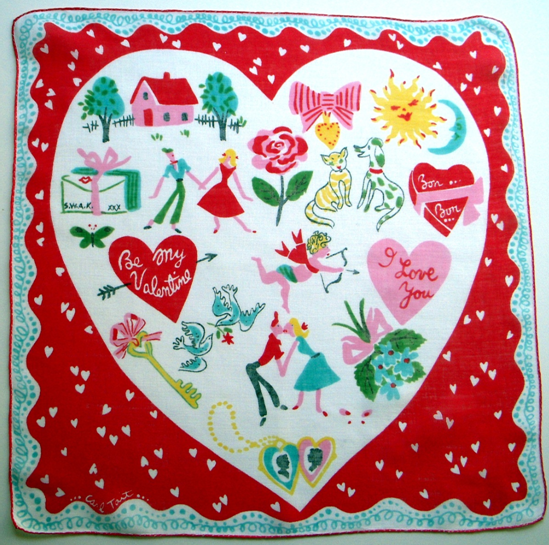 Searching for just the right Valentine can be like searching for the perfect white shirt, neighborhood that feels like home, or special pet to love. Each offers something special and unique, but only one will speak to your heart. 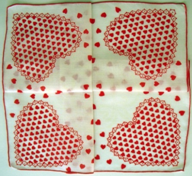 Valentine’s Day is a great time to show the person you love just how much you love them by getting the perfect gift. It could be as simple as flowers or it could be as heartfelt as a gift from WatchShopping. 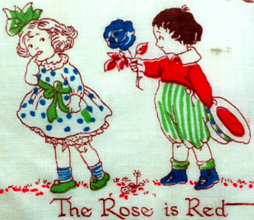 Valentines come in every shape, size and color, with far too many styles to showcase in a single blog. 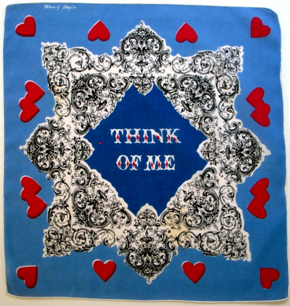 I’ve chosen a small sampling to illustrate the variety of ways hankies can convey “I love you.” Certainly there’s the ubiquitous Key to My Heart message. Sometimes the message is quite literal, as seen here. 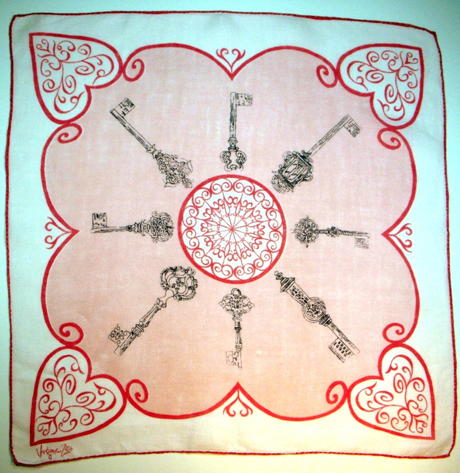 Often the message is soft and romantic like this pinwheel of keys surrounding a rose window formation, anchored by fanciful, curlicue heart corners. The attention to detail of the line drawing of the keys underscores the message that like people, no two keys are alike. Note the Greek god at 7:00 o’clock, the Celtic cross at 9:00, the scepter-like handle at 10:00, and the king’s crown at 1:00. 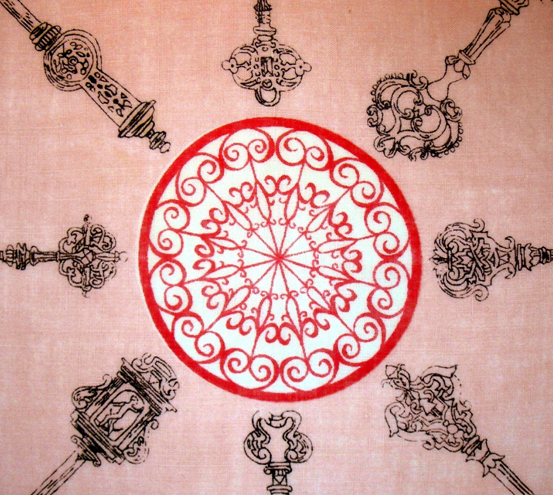 Surely one of them will appeal to you, and it only takes one special key (person) to unlock our heart. …then I did the simplest thing in the world. I leaned down…and kissed him. And the world cracked open. 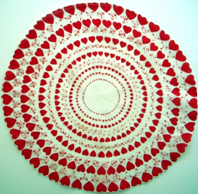 A legion of hearts locked in unison challenge us to break their regimented ranks. Are they warriors for love? 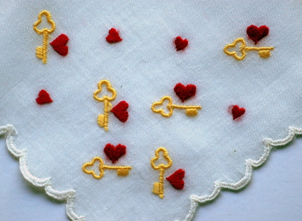 The white-on-white images of tiny keys was so transparent as to almost be invisible, so I photographed this with a color backdrop in order for you to see that indeed, each lock comes with its own key, fashioned with a heart shaped head. Crisp and clean, fun and fanciful, this overall pattern is refreshing and as contemporary as if it had been created today. 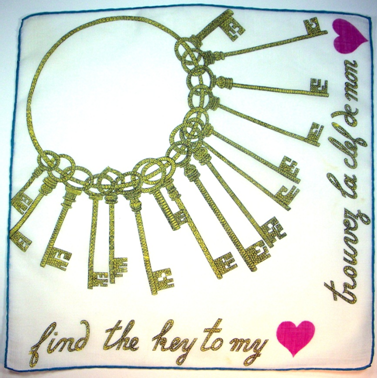 Another jangle of keys, this time embroidered in gold are sprinkled betwixt and between a shower of kisses bordering this scallop edge beauty. 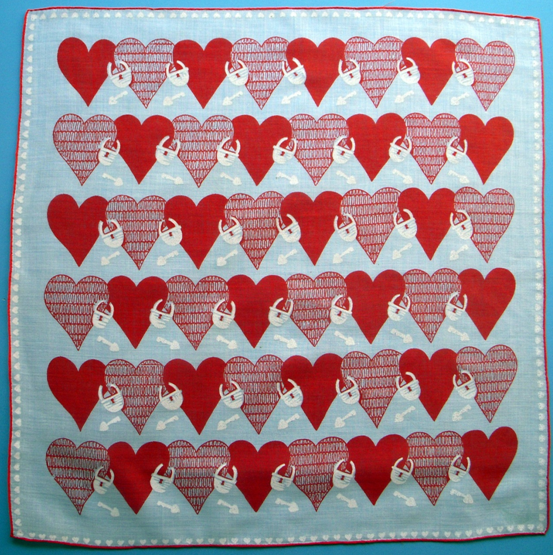 Who could doubt the giver entrusted the recipient of this handkerchief with the key to his heart? 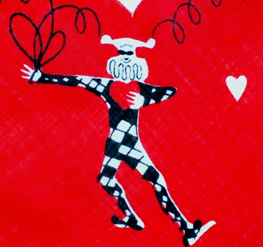 Here’s a fanciful number with a mult-heart border sporting bold and beautiful heart shaped locks.The mask leaves us wondering – is this proclamation of passion a gift from a secret admirer? 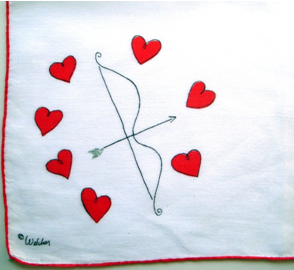 Also note the plethora of cupid’s arrows in bold black and white which weave and play throughout the image. Love takes off masks that we fear we cannot live without and know we cannot live with. 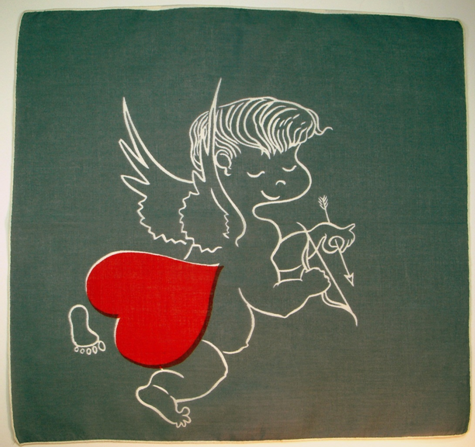 Here’s a risqué little cutie with a heart shaped bottom getting ready to draw his bow in the name of love. 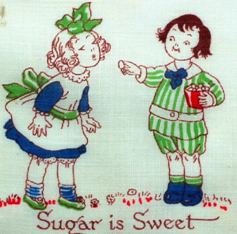 Unlike many Valentine hankies which are sugary sweet or passionately red, the artist chose to utilize a reverse line drawing against a sophisticated gray backdrop. I love gray, and it’s a surprising but wonderful choice, don’t you think? A border of passionate hearts shot straight through with crisp navy cupid arrows creates an eye-catching accessory to dangle from your suit pocket on Valentine’s day. (see Flirting) The design is colorful yet minimal, conveying volumes in a subtle, understated manner. 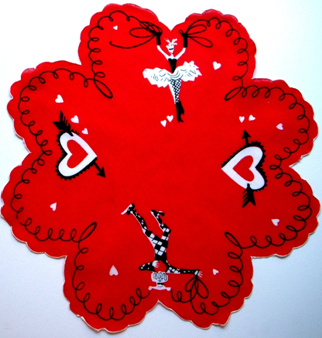 Whereas this hankie leaves no doubt that the giver’s heart has succumbed to cupid’s spell. 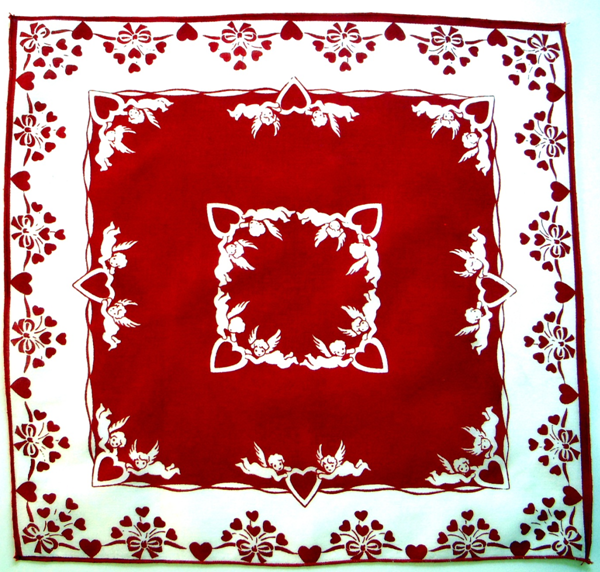 The square handkerchief was often employed as an actual greeting card. 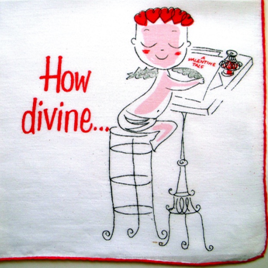 Here we find Cupid at the drawing board, laying plans for his conquest. His thoughts are so full of love that instead of hair, he has sprouted a head full of hearts! Below, we see the front and reverse of the card. The card opens to reveal a very confident little guy who has made certain his target will not be missed! 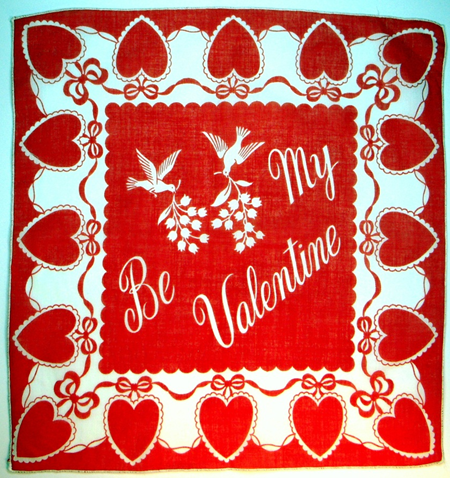 Whether viewed from north, south, east, or west, cupid couples and bouquets of kisses say “Be Mine” – sure to win any girls heart. 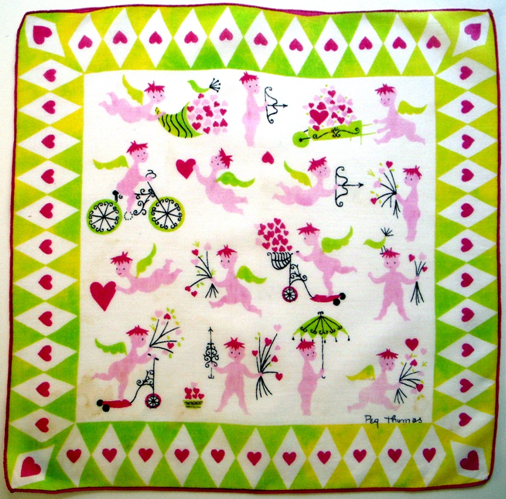 Another hankie awash with cupids is this fun and frisky harlequin print in brilliant lime green and pink. 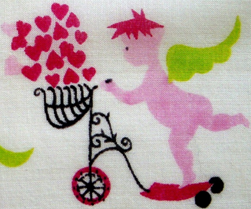 These busy little love monkeys skitter hither and yon in a flurry of romantic anticipation as they deliver bushels and boatloads of romantic greetings. 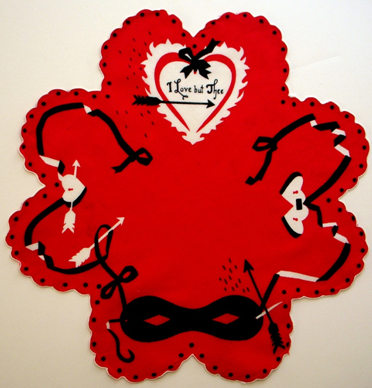 Cupid again takes center stage in this Valentine which covers everything from keys to lockets, to lovebirds, to bouquets, candy, love letters and stolen kisses. 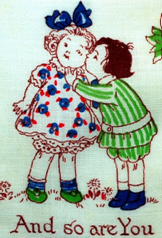 Who else could instigate and sustain all this romantic mayhem but our darling cherub tied with a big red bow? 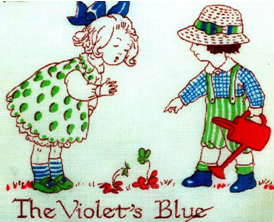 Note the lovebirds exchanging a flower, a common image to be found on Valentines Day. 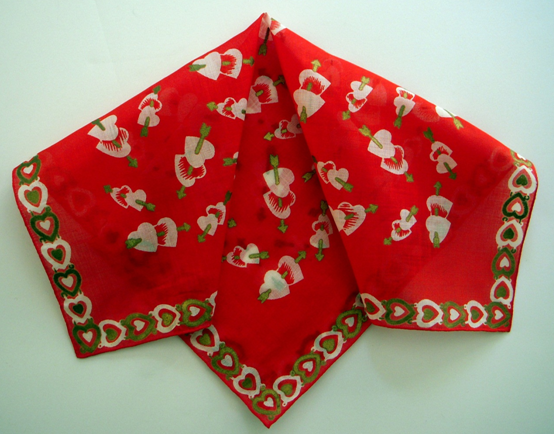 In this next hankie, the lovebirds jump right from courtship to marriage as they transport bridal lily-of-the-valley in their beaks for the intended recipient. Here’s an ad from the February 1949 issue of Mademoiselle showcasing “hand-rolled, fine, sheer pima cotton for fifty cents each”. 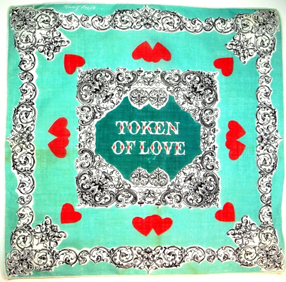 These designs by textile designer Tammis Keefe resemble old fashioned lace edged hankies and carry simple phrases of love. 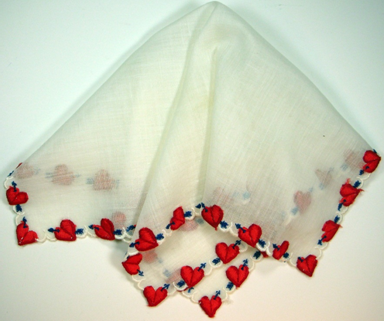 They’re great because you can have the colorful lacey borders peeking from your pocket while the message of love remains hidden deep in the folds. 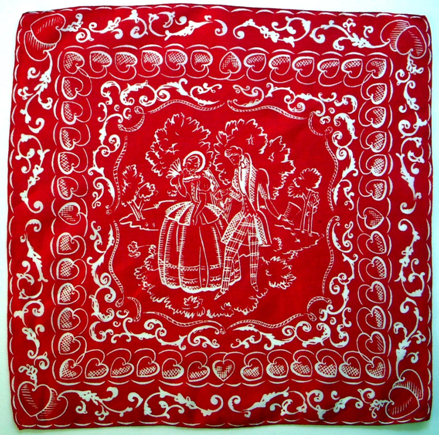 This beautiful handkerchief, though possibly not considered strictly a Valentine, could even be gifted to a man to wear as a dress handkerchief in his suit pocket. 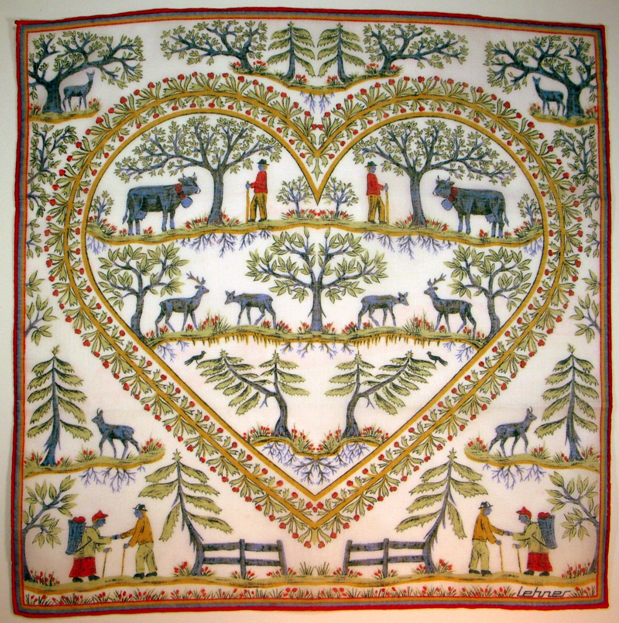 The detail is truly wonderful, particularly for anyone who loves agriculture or nature. Certainly it could be framed to be studied and enjoyed. 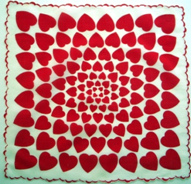 Whatever your style, my wish for you is that you receive all the valentines your heart can hold. There is no end to the variety of permutations you can find when it comes to Valentines. I do hope you’ll consider gifting one to someone you love. I think you’d be surprised to know how many of them are cherished and carried daily as a talisman of love and affection. 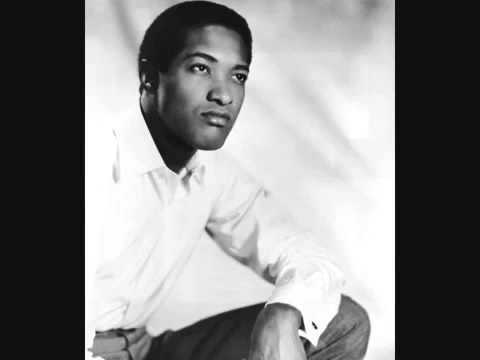 If we’ve put you in the mood for a bit of cupid hunting, here’s a link to Sam Cooke’s 1961 hit Cupid, along with the lyrics. 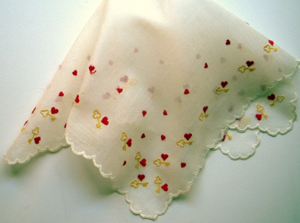 So enjoyed viewing your Romantic Hankies. Love going back in time to see the art work. Thank you for sharing ! How thoroughly delightful!!! And I get to write this with Sam Cooke singing Cupid in the background. (Another clever addition to your blog!) 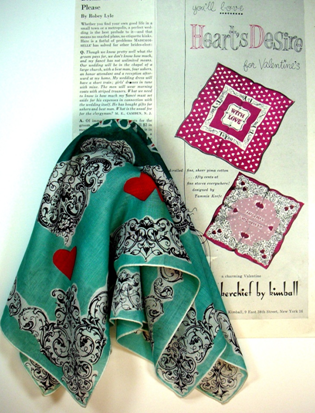 Such beautiful hankies, and accompanying lovely prose. Your blogs are enchanting. I’m forwarding this to many of my friends (and will suggest they subscribe as well) — women who appreciate beauty and good writing! 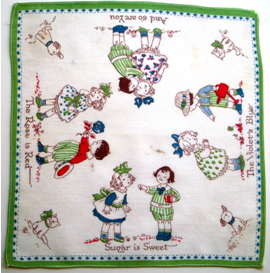 I’m so happy to be learning about hankies and a bit of history. Thank you so much.